Welcome to ARIS video tutorials. This video tutorial will demonstrate how to create your own report scripts in the design view of the Script Editor. The design view enables you to create report scripts via script templates without further programming knowledge. You can create and manage your report scripts in the "Scripts" module. Various templates for report scripts are available to you here. They are the basis for creating your report scripts in the design view of the Script Editor. You can manage your report scripts efficiently in the "Reports" folder using various categories. To create a new report script you can use one of the many existing categories or create a new category. You can easily create a new category with the pop-up menu. The new category is created as a separate folder under the name that you selected. Here you can also use the pop-up menu to easily create a new report script. The Script Wizard helps you create your new report script. First, give your report script a name and specify general settings if necessary. When you have done so, click "Next" at the bottom of the Script Wizard to switch to the "Context" page. The context specifies the database elements that you can run your report on later. Select the context "Group". 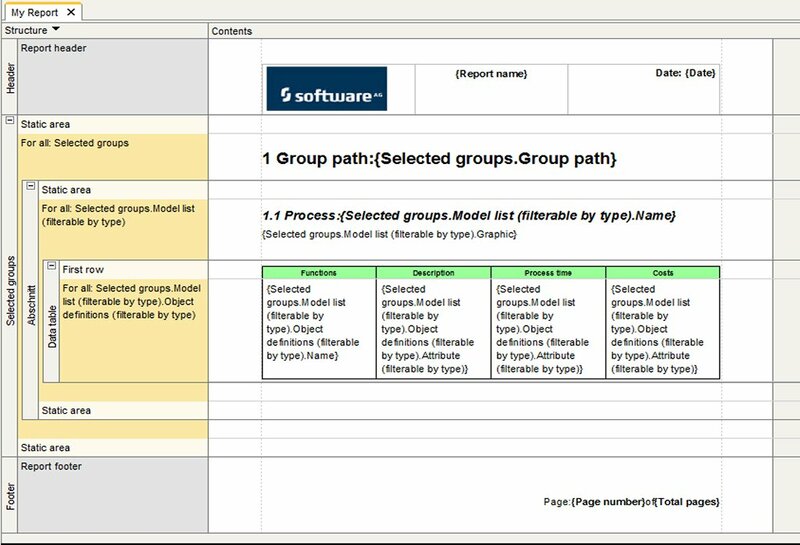 This means, you can select specific groups in the database and with the help of your report, evaluate the desired data. For example, the names of the groups themselves or the models subordinate to the groups. To create a report script in the design view enable the "Use report script template" option. The new report script will then be opened in the design view based on the template selected here. The example in this tutorial is based on the preset default template. Select the formats in which the report should be output in the "Supported output formats" field. You can also set the report properties, as with most of the other properties, after closing the wizard. Finish filling out the wizard to create the report script. The report script is saved in the category created previously and displayed in the design view of the Script Editor. Your new report script is divided up into one header and footer each and a main section. The report script already contains text fields used often in the header and footer. A special section named "Selected groups" was inserted into the script for the "group" context that was set. In this section you can insert further queries for your report. The report script is now available to you in this form for further configuration according to your requirements. In this tutorial you learned how to create your own report script using script templates in the design view of the Script Editor.